I Got My Christmas Wish! Christmas Eve in the Big Mango. With all the lights and Christmas carols playing, you would swear you were in a Buddhist Christian nation. And yet, you are not. 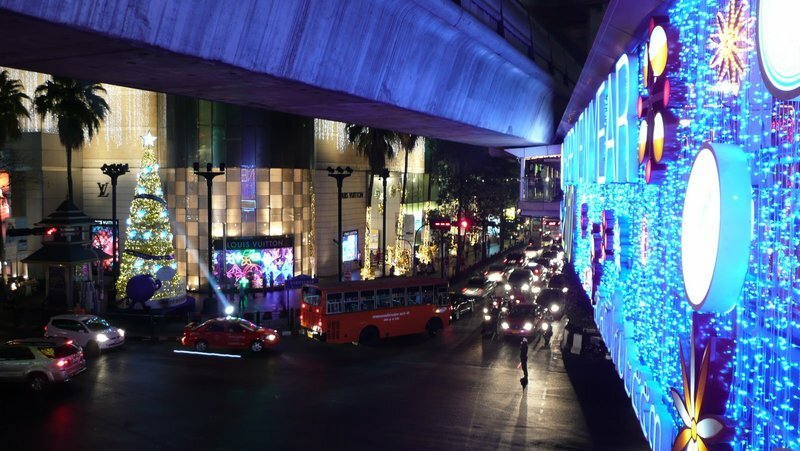 Decorative lights adorn the pedestrian bridge crossing the Ratchaprarop – Rama I junction. Louis Vuitton’s shop at Gaysorn plaza is in the background. Stephanie arrived from Melbourne yesterday morning about 5:30. Going back eleven years, Stephanie was one of the managers with whom I worked when I was based in Hong Kong opening the AMC Festival Walk 11 cinemas. A few years later she moved to San Francisco for several months and lived with Tawn and me. She has since moved to Australia and we see her every second year or so here, there or elsewhere in the world. She’ll be our first guest in The Annex which means I’ll be working from my laptop instead of my office armoire. That’s okay as the weather is nice and I’ve set up on the balcony overlooking the pool. If it wasn’t for the construction noise from that new seven-level condo going up down the street, it would be quite peaceful. Last night we met Tawn and headed to Central World Plaza for dinner. While walking through the mall I spotted a large sign covering the entire storefront of what used to be a fondue restaurant. 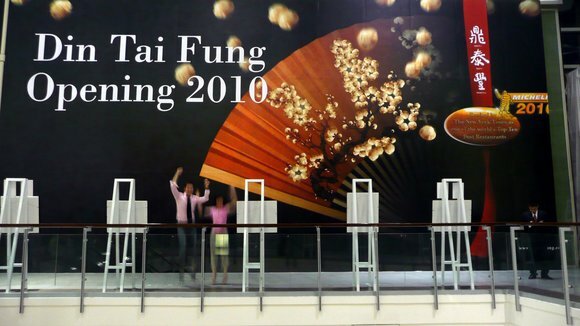 Opening 2010: Din Tai Fung! Yes, Virginia, there is a Santa Claus and he is bringing me the best xiao long bao dumplings in the world. Let’s hope this branch of the venerable Taipei chain will be better than some of their other foreign outlets, which are reportedly inferior to the locations in Taiwan. I was so excited to see this that I wanted to text message Andy and Sugi immediately, which would have been about 7 am for them. Thankfully for them I didn’t have their number on my phone. Whew! This evening Stephanie’s sister and brother-in-law arrive with a dozen of the in-law’s family members. I’m not sure what the plans are for holiday dinner but we will see. I suspect that Christmas celebrations will be minimal but we are planning something big for New Year’s Day. This entry was posted in Uncategorized and tagged Central World Plaza, Din Tai Fung, Dumplings, Xiao Long Bao by christao408. Bookmark the permalink. You are so lucky. I love those things. wow, Din Tai Fung in Bangkok, yummy! You and Tawn must have very good boys this year that Santa grant you such nice a present. One more good reason to visit the condo annex, lol. Wish you and Tawn a Merry Christmas! I can just picture Santa behind 8 tuk tuks! Are those 2 people waving at you in the picture for Din Tai Fung? I hope you and Tawn have a great Christmas. @ElusiveWords – That would be Tawn and Stephanie, jumping up and down in excitement. @everyday_yogi – Gosh, yes you are missing out! @stevew918 – Yes, I think we have been especially good all year long. @yang1815 – Your number is on my US sim card not my Thai one. I figure I can catch you on Xanga or MSN easily enough. @amygwen – I feel very lucky. @christao408 – That’s still very exciting!!! Awesome :)Is that you and Stephanie jumping for joy? Hahaha.I keep hearing you talking about an Annex but never ask you about it. Did you acquire part of an adjacent unit and renovate it?EDIT: Oh, nevermind I should have read the comments. I was in Thailand for Christmas 2006, and there were soooo many christmas Trees and stuff, it felt rather like a Walmart Christmas everywhere; I remember seeing a huuuuuuge lit-up tree outside the big airport; very very beautiful. I hope you will give us all a photo blog about the food there… So pleased that Santa has come through with a special gift for you! Have a very Merry Christmas! haha the evil tentacles of din tai fung is about to make landing in bkk. very cool. there should be a din tai fung world thread. Is there one in LA? I think I have eaten there, don’t remember. It is the same with Delhi, the way the malls are decked up- you would actually think you were in one of the Christian countries. Christmas in my home state Kerala is really big because we have a significant Christian population. @arenadi – No worries, Mike. The Annex is written about here and there’s a tour of the two units here. @Redlegsix – Thanks Ruth Ann and a very merry Christmas to you and yours. @Dezinerdreams – There is one location in the LA suburb of Arcadia. I didn’t know Kerala had a large Christian population. Interesting…@LostSock21 – Always tough to keep quality control at frachise locations. @ungrandvoyage – Evil tentacles? Has there ever been a force for good more potent than Din Tai Fung? =P@murisopsis – There is a link to the entry about our Din Tai Fung experience in Taipei embedded in this blog entry. For your convenience it is http://christao408.xanga.com/717159865/din-tai-fung-dumplings/. @Wangium – They are kind of like Starbucks in that respect. @secade – I didn’t realize you had been to Bangkok before. Oh, nice to catch some dumplings in the Big Mango! The Gayson Plaza intersection is so vibrant, especially with that giant TV screen near the Central World Plaza! You and Tawn have a very Merry Christmas!